In our last post, we started looking into what is inside a scope. In today's post, we will look more into the subject of lenses, as used in scopes. Lenses can be made of different materials. Cheap scopes might use lenses made of plastic, whereas better quality scopes have glass lenses. Really high quality scopes use correspondingly high quality glass for their lenses. We will look into what all this really means. We saw this image in our previous post. It shows that light coming from a great distance is focused by our lens, onto a point and the distance between the center of the lens and this focal point is called the focal length (shown by 'f' in the image above). Well, this is all very good in theory, but in actual practice, some of the incoming light is reflected back, instead of passing through the lens. This happens even on lenses made of glass. Anyone can verify this fact by looking out of a plate glass window -- notice that there is a faint reflection of yourself visible through the glass, no matter how well polished it is. The amount of light being reflected back depends on the material that the lens is made of. This reflection can be reduced by applying coatings on the lens (we will study these in a few minutes.) Typically, each air-to-glass surface could reflect back about 3-6% of the incoming light and each lens has two such surfaces. Now, in a simple telescope, we just have two lenses and that's four surfaces. However, as we saw in the previous post, just using two lenses in a tube gives the user an inverted image. If we need our image to be facing the correct direction, we need at least two more erector lenses to flip the image back up and we may also have another flat glass plate onto which the reticle is etched. Suddenly, we are looking at upto 10 surfaces and maybe even more, if there are more lenses or glass plates inside the scope, upto 16 or 18 surfaces even. The amount of light being reflected back by all these surfaces start to add up and this means we could be losing upto 50% of the light coming into the scope, due to the reflections from the various surfaces. Therefore, in low light conditions, it could make the image much harder to see. So where does this reflected light go? In many cases, it doesn't just disappear off into the distance. Instead, a part of the reflected light keeps bouncing from surface to surface of the various lenses inside the scope and after the second, third or fourth (or fifth, sixth etc.) reflection, some of this light eventually comes out of the eyepiece. 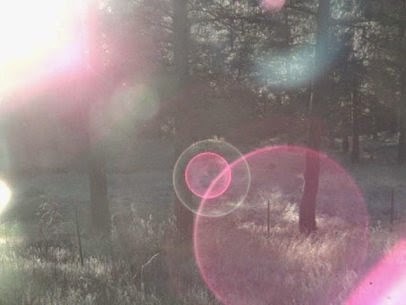 This scattered light is what causes the so-called "lens flare", which causes the image to become hazy, reduces the contrast of the image, removes image details and shows rings of different colors around the image. An example of lens flare. Notice how hazy the image looks. One more thing to note is that the glass in the lens does not pass all wavelengths of light through the same way. Therefore, rays of light of one particular color may reflect more light from the glass than rays of light of a different color. The way to reduce all these problems is by applying special anti-reflection coatings on the glass surfaces. As early as 1886, Lord Rayleigh had discovered the use of thin film coatings on lenses and in 1909, Harold Dennis Taylor had discovered a chemical process for producing such coatings for Cooke Optics Ltd (a British manufacturer of camera lenses). These coatings work because they have a refractive index value that is between the refractive index values of air and glass and they reduce the amount of light reflected back than if the light were to directly travel from air to glass. Coatings of this sort can halve the loss due to reflection. Another type of anti-reflection coating is based upon using the principle of light interference, first discovered by Alexander Smakula, an Ukrainian-born scientist working for Carl Zeiss AG of Germany in 1935. This was a significant improvement to anti-reflective optical technologies and the invention was classified as a German military secret during World War II. After the war, Dr. Smakula moved to the United States and became a professor at MIT. Most modern lens coatings use the types of coatings that he pioneered. The most common coating material used these days is magnesium fluoride, although aluminium oxide and titanium oxide are also used. Cheap manufacturers use the dip and bake method to apply the coating, but these coatings do not stick to the lens as well and can wipe off in a year or so. High end manufacturers use a different more expensive method involving molecular bombardment and vacuum chambers to apply a thin film on the lens surface. Applying a single layer of coating can drop the reflective light loss to about 1.5-2% (compared to 3-6% for an untreated surface). Of course, the major shortcoming of a single-layer coat is that it works best on particular wavelengths (colors) of light, particularly if the thickness of the coating is equal to 1/4th of the wavelength of the light. The solution is to apply multiple layers of coatings, each one geared towards reducing reflective light over a different range of wavelengths. The best multi-layered coatings can reduce the reflective light loss to around 0.2% or so per surface, which means that scopes using these coatings can let over 95% of the light through and produce a very sharp image indeed. Besides these anti-reflective coatings, some lenses also have additional coatings applied for a couple of different purposes. Anti-scratch coatings make lenses more durable and help prevent minor scratches from happening on the lens surfaces. Some lenses also have a coating that prevents water from sticking to the glass. This is because water droplets can increase the glare and reflectivity of a glass surface. Applying a coating that repels water allows the scope to be used in rainy or foggy conditions, without affecting image quality as much. A coated lens will show a colored hue when viewed from the side. Blue hues, purple hues, green hues, red hues and pink hues are commonly seen. The color is not the color of the coating material (which is colorless), but is the color of the wavelength of light that the coating is least effective against (which is why it is being reflected back instead of being let through). Of course, adding additional coatings also increase the price of the scope. The industry uses a few terms to describe how many coatings are applied. We will look at some of these terms now. If the manufacturer says that their scope has "coated lenses", this means that the lenses have a single layer of anti-reflection coating applied. Usually, this coating is not applied to all the lenses in the scope either, but only to the first and last lens (i.e.) only the lenses that you can see from outside the scope. Some really cheap manufacturers only coat the outer surfaces of the two outside lenses and leave the rest uncoated. If the manufacturer says that their scope has "fully coated lenses", this means that all the lenses in the scope have at least one layer of anti-reflection coating applied to every surface. This offers a significant improvement over the scopes described in the previous paragraph. If the manufacturer says that their scope has "multi-coated lenses", this means that at least some of the surfaces have multiple layers of anti-reflection coatings. This does not mean that all the lenses have multi-layer coatings applied though. Quite often, the multiple layers are only applied to the outer surfaces of the first and last lenses only (i.e.) the two lens surfaces that can be seen from the outside of the scope. The first multi-coated lenses were available commercially some time in the 1970s. Finally, we have the scopes that are "fully multi-coated". This means that all the lenses in the scope have multiple layers of anti-reflection coating applied to all their surfaces. These are usually the most expensive types of scopes. In general, fully coated lenses and fully multi-coated lenses produce better images than the other types. Besides these coatings, the scopes may use additional coats. Some manufacturers apply a hard protective coating to the outside surfaces of the first and last lens, which protects the lenses from scratches and abrasions (e.g. DiamondCoat and DiamondCoat 2 by Leupold). Hydrophobic coatings break up water droplets and prevents them from sticking to the lenses. Hydrophobic coatings are available from several manufacturers, such as Leupold, Bushnell, Pentax etc. and are known by different names, such as RainCote, Rainguard, Hydroshield etc. It must be noted that lens manufacturing technologies have significantly improved over the years. Today, it is possible to buy a cheap telescopic sight for less than $100, which has better resolution, magnification and light gathering properties than the best telescopic sight manufactured around 50 years ago. In fact, the cheap scope may not even have glass lenses, but might be using optical grade plastic lenses instead! In our next post, we will look at some more details of the internals of scopes.